The only constant in the pharmaceutical industry seems to be that it is in a perpetual state of change. Improvements in process, regulatory changes, market shifts and the ever increasing number of new products make change in processes inevitable. Also driving change are advancements in manufacturing technology that make changes in process mandatory to stay ahead in a highly competitive industry. Further complications include a heightened awareness of the effects of some of the materials that were considered safe just a few years ago, but now have come under the scrutiny of the FDA as potential health hazards. This impacts many of the refinement processes manufacturers use. Latest statistics place North America as the undisputed leader in both pharmaceutical production, and consumption. In the USA alone, consumption has exceeded 425 billion, per Statista, a statistical research publication. The greatest areas of market growth have been in the Eastern European, African, Asian and Latin American markets. North America has remained relatively constant in growth and in revenue spend, and it remains the largest of all global producers as well as the largest market. Despite twenty years or more of growth, the pharmaceutical industry has not kept pace with other industries in terms of manufacturing processes and sophistication. Some industries, the automotive for example, have turned many tasks over to robotics. This is major change from the old days of hands on assembly, and this has enabled the auto industry to control costs, shorten turnaround time to develop new products, and most of all allows its constituents to maintain a competitive edge in an industry allows for very little error. The pharmaceutical industry, although much modernized in the past 20 years, can still benefit from further automated operations, and in fact must do so if it is to maintain its competitive edge in a changing global market. MIT has partnered with the US Government and the pharmaceutical industry to research and develop more automated, cost effective and sterile manufacturing methods. Freedom from contaminants, consistency in this case is primarily for the safety of the end user of the products who are the greatest beneficiaries when product quality is at a high level and batch to batch consistency is precise. The face of the Big Pharmaceutical Companies in the global scheme of things is changing. Up until the mid 1970’s, large pharmaceutical firms were the dominant force and large companies were characterized by their ability to conduct every aspect of product development on their own. This included research and development, which proved to be very cost effective despite the huge expenditures. Research and development could also be directly related to new and effective drugs with measurable effects on the mortality rates. The companies were making money, spending money, and saving lives as well. The process could trace its roots back to the nineteenth century when for all intents, the pharmaceutical industry was dominated by a few giant players. This idyllic scenario had begun to play out, and by the 1980’s, smaller biotech companies with academic liaisons began creating viable products at faster rates than some of the traditional industry giants. While pharmaceutical production will never downscale to the level of a ” Cottage” industry”, there are clearly opportunities for those who do not have a global reach. This new generation of pharmaceutical companies will challenge the established giants of the industry, and will create a heated and highly competitive scenario for everyone in the industry. These new facilities will be comprised of smaller teams and focused on even shorter turnaround times in the development of new products. Another development in the restructuring of the pharmaceutical industry will be the emergence of subcontractors with highly specialized products that will enable many manufacturers of pharmaceuticals to concentrate on their core businesses rather than having to develop components to achieve their goals. One company that comes to mind is SaniClean Strainers. 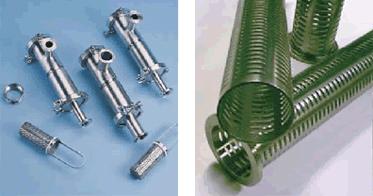 This is a highly specialized company, 100% American, that produces some of the most complex and critical components in the manufacturing process: the wire mesh filtration elements. All of the centrifuges, separators, and strainers depend on the accuracy and tight tolerances of this product to maintain the required purity of their own finished product. How then, do we cope with the ever more complex world market and increasing competition? -All levels of management will be required to increase their awareness of the many subcontractors that support their operation, and to depend on them to provide solutions to ever increasingly complex manufacturing challenges. – Industries will have to form greater alliances with academic institutions and resources so as not to miss important developments that are literally occurring overnight. -Pay particular attention to potential anything that newer manufacturing techniques can offer to make your operation more efficient. As the world of pharmaceutical production continues to grow, as it will with the increase in world population, all who are involved in the process of developing and manufacturing these life saving medications will have to re examine many of the old disciplines and replace these methodologies with newer processes that are consistent with our ever changing industry.